Alhambra Wall Scoring – DOH! I played my Origins 2005 purchase of Alhambra for the first time during my monthly game night (AGN) and recently taught it to Noah, Sophie, and Lisa. Both times, the wall scoring seemed way too powerful. The rules were very vague and so I did some digging on the BGG.Wouldn’t you know it, we’ve been playing it wrong. The story on the street is that the designer intended that the wall scoring occurs at the end of every scoring round. We played it that way even though the translated English Rio Grande Games rules can easily be interpreted as only scoring the longest wall during the final scoring round. The killer, however, is that everyone is supposed to get points for their own longest wall every scoring round…not just the single person with the longest wall. That’s a horse of a different color! Author mattPosted on July 17, 2005 January 27, 2016 Categories All Posts, Board GamesLeave a comment on Alhambra Wall Scoring – DOH! I had held back a little bit on teaching Sophie (11) and Noah (9) Amazonas. For Euro-gamers, the mechanics are easily grasped and reminiscent of other games (e.g. Ticket To Ride, El Grande, and Tikal) but there are enough rules and complexity of mechanics that I thought maybe it was at the edge of their ability. But I thought maybe I would give it a try anyway. The end result showed that I’m an idiot and know nothing about the capabilities of my children. In fact, I would suspect I would have a harder time teaching this game to a non-gamer than a child-gamer. They quickly picked up on the mechanics and offered many examples when it would be good to play the native card to thwart the ill effects of the negative cards like the forest fire and monkey thief. They also fully grasped wanting to bid as high as possible when the native specimen token was up for grabs but tempered that will bidding only what they thought was necessary so that they didn’t pay too much for it. I held nothing back during play and offered only a few tactical tips during the game. The final score was Me (13), Noah (12), Sophie (10).Sophie’s score would have actually been higher but she built a very costly expedition hut for 5 gold coins when she could have used a waterway to build more efficiently. I didn’t see it until the turn after she built so don’t start giving me any flak about letting her ‘step in it’. You can buy Amazonas from the great people at Game Surplus. The July 2005 edition of game night took place last night at my house. We had 7 so we had the rare opportunity to have two tables running. We started earlier than usual. Thanks Gus for picking up the pizza…I still need to pay you back so don’t let me forget. We managed to get in games of Alhambra, Balloon Cup, Clans, and Amazonas. Keith blew away the field in Alhambra but he’s got to chalk that up to beginners luck since this was the first time anyone has played. Tim beat Ken at Balloon Cup having never played it before; way to go Tim! I heard Rich won at Clans but I wasn’t at that table so that could be just a rumor. 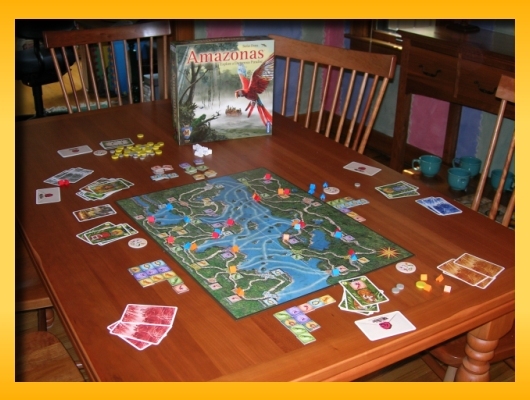 Tim won again at Amazonas….beginners luck, I’m sure. Ken will back me up on that, right Ken?…Ken? Thanks guys for coming, I had a good time. In Amazonas, there is apparently a language translation error in the English form. After purchasing a native token you must declare the specimen type that the token represents. However, the token must be declared to be of a type of specimen that you already possess. In other words, you cannot take a native token for the sole purpose of helping you obtain the 5-specimen bonus. I taught Sophie Oceania this morning. 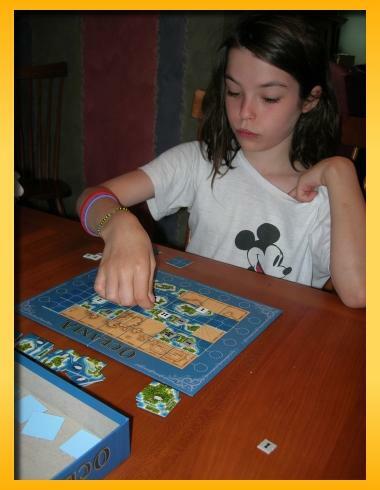 Sophie really liked the game and compared it to a cross between Carcassonne and Metro. Do you think my kids are going to be gamers?